Documentation leaders are knee-deep in technical communications issues, but rarely get help on people side of the fence. If that sounds familiar, you’re not alone. Effectively managing technical writers and smart documentation teams requires leaders equipped to tackle an increasing variety of “people issues.” We’re here to help. 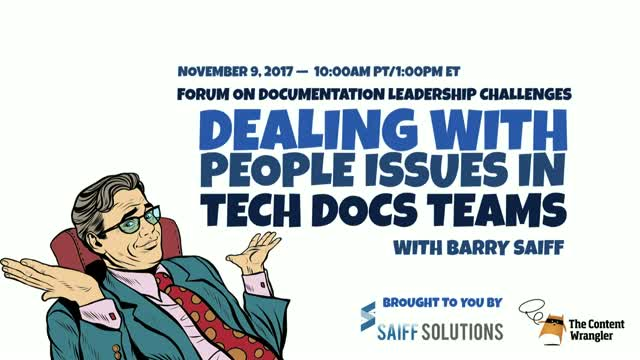 Join guest host, Paul Perrotta, and Barry Saiff—Founder and CEO of Saiff Solutions, author of The Seven Habits of Highly Effective Technical Communications Leaders, and a 30-year veteran documentation leader—for a discussion about the staff management challenges that many documentation leaders face but rarely talk about. Attend this webinar to learn how to you can overcome some of the most difficult-to-solve "people issues.” You’ll discover a wealth of resources you already have at your disposal to help you resolve interpersonal challenges.